Whether you listen to rap, heavy metal, or classical music… Whether you want to rattle the windows of houses while you drive by or you just want to listen to your music with the quality of a live concert… Your audio system can greatly benefit from an amplifier. Power for upgraded speakers —When you replace factory speakers with higher quality, aftermarket speakers or component systems, an amplifier will provide the correct power for optimized performance and sound quality. The Source simply isn’t up to the task and if you don’t add an amplifier, the money spent on better speakers for better sound is not as effective. In most cases you do not want to add an amplifier to your factory speakers. The manufacturer has selected those speakers for a specific reason and they may have a low impedance voice coil or other characteristic that will make them not compatible with aftermarket amplifiers. If you want to make your factory sound system louder or improve the sound quality, replace the speakers and add an amplifier. Upgrading your speakers and adding an amplifier is the best way to get better sound in your vehicle. A system upgrade like this could include a four-channel amplifier and the appropriate size speakers to replace those built into your vehicle at the factory. By replacing the factory speakers with higher performance, aftermarket speakers and powering them with an amplifier that provides a clean audio signal, you will vastly improve the sound and still leave the interior looking stock. When shopping for upgraded speakers and an amplifier, simply match the power output of the amplifier to the power handling of the selected speakers. If your front and rear speakers have slightly different power handling ratings, use the lower rating and find an amplifier that comes close to that number. If the rating is a bit higher or a lower, it is ok since most speakers can handle slightly more power than their rating. 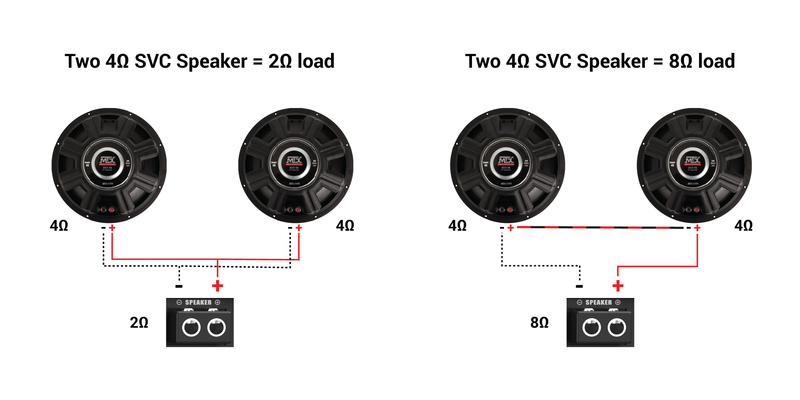 (It can be more harmful to the equipment to under power the speakers than to provide more power than the rating) Be sure to use RMS power ratings as your guide when selecting speakers. Some speakers use terms like Peak Power or Max Power, neither of these reflects the true performance of the speakers as well as the RMS Rating. All four-channel amplifiers have gain settings for both the front stage (front) ad rear stage (rear) speakers so their output level can be adjusted based on your listening preference. Some people like their sound system to have a strong front stage and a less powerful rear stage so the rear channel gain control can be set lower than the front. You can also use the fade control to adjust the sound from front to back in the car. If you like rear sound in your car to be as loud or similar to the front you can match the gain settings to get the same output in the front and the rear. The four channel MTX THUNDER75.4 would be a great option. Four-channel amplifiers are very versatile and can be used in other configurations. 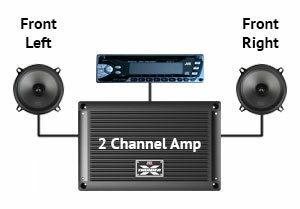 For example, a four-channel amp could be used to power a pair of speakers and a subwoofer. Two channels are bridged together to power the sub and the other two channels are used to power the speakers (1 channel for each speaker). 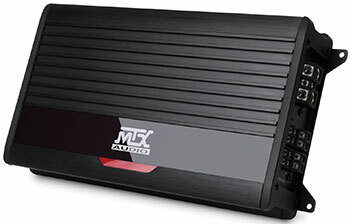 There are also five-channel amplifiers like the high power MTX XTHUNDER800.5 800W RMS Amplifier that can power your entire system from one convenient and compact package. 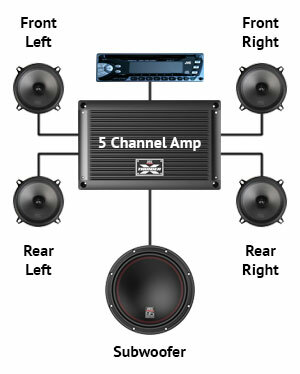 The single channel typically has significantly more power than the other four channels and is used to power the subwoofer, while the other four channels are used to power the speakers. The process of matching the power output of the amplifier channels to the power ratings of your speakers and subwoofers will determine which of these options is best for you. Mono block, single channel amplifiers, are designed to power subwoofers and generally work with a wide range of impedances. They typically have tone controls and filters specifically designed to reproduce the low frequencies of the bass notes. Although many 2 and 4-channel amps can be bridged to increase their power enough to run a sub their design is not typically as efficient as a mono block amplifier, which can lead to thermal problems and they generally can only play in 4Ω bridged mode limiting the choices you have for selecting a subwoofer. You'll need to make sure your amplifier is stable to play at the impedance your subwoofer(s) is wired at and can produce the correct amount of power to closely match the subwoofer's RMS power rating. For example, if you choose two 12” subwoofers with single 4-ohm voice coils, you could wire your system to have a 2-ohm final impedance or an 8-ohm final impedance. The various voice coil configurations enable different wiring options to get to your desired final impedance in order to match your subwoofers and amplifier. Remember, if you're adding a sub to a factory system, you’ll need a subwoofer amp that has speaker-level (high level) inputs, so it can get its signal from the factory speaker wires or you can buy a high to low converter, if the amp you own or purchase doesn’t have high level inputs. Amplifiers produce power for your speakers and subwoofers but they need a power source to do that. You’ll need to wire your amplifier's positive input to the positive terminal of your vehicle battery and find a good ground somewhere on the vehicle for the negative input. You can use the negative terminal on the battery or, if you can find a good ground location closer to where the amp is being installed, you can save yourself some installation time by connecting the wire there. The amplifier will also need to be connected to the Source so it can receive the audio signal. If you are using the factory wiring, you will connect that to a high to low level converter (if necessary) and then run RCA wires (interconnects) from the Source to the amplifier, if your aftermarket Source has low level inputs you can connect RCA wires and run them directly to the amplifier. Amplifiers don’t generally include all the parts you need to install and connect them to your sound system. However, you can purchase wiring kits (amp kits) that include parts such as power wire, ground wire, speaker wire, remote turn on wire (if necessary), fuses, battery terminals, fuse holders, etc… MTX StreetWires has a variety of amplifier kits that will make the installation of your amplifier quick and easy. If you need help selecting an amplifier, matching impedances, choosing an amp kit, identifying the proper size speakers for your vehicle, or anything discussed in this article, please call our Technical Support Team at 1-800-CALL-MTX, email them at support@MTX.com or chat with them at MTX.com.